The single most important decision you will make for your pet is about diet and nutrition. Proper nutrition is the key to a long and healthy life for your dog or cat. Don’t underestimate the importance of nutrition. 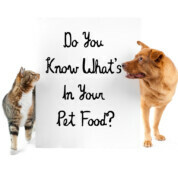 How Does Your Pet Food Compare? Thinking of switching to Life’s Abundance Holistic Pet foods? The secret to superior pet food lies in the formula itself – not only in the ingredients, but also in the proportions of those ingredients to each other. Compare other brands to Life’s Abundance and see how the competition measures up.